David Tyndall of Miami Trace raises the leg of his opponent at 195-pound match Saturday, Jan. 26, 2019 at the Miami Trace/McDonald’s Invitational, the final wrestling tournament in the Panther Pit. Shane Seymour of Miami Trace wrestles an opponent at 132 pounds at the MT/McDonald’s Invitational Saturday, Jan. 26, 2019. Miami Trace’s Devin Seymour gains control of his opponent in a 120-bout at the Miami Trace/McDonald’s Invitational Saturday, Jan. 26, 2019. The Miami Trace Panthers held the annual Miami Trace/McDonald’s Invitational in the Panther Pit Saturday, Jan. 26. It was the final wrestling tournament to be contested in the storied, old gymnasium. The Panthers finished in a tie for fourth place with Warren, each with 214 team points. Greenville won the meet with 280.5 points, followed by Walton-Verona in second with 232 points and Groveport-Madison in third with 216 points. Logan Elm was sixth with 213.5 points. Zane Trace was 10th with 126 points, Adena tied for 12th with 98 points, Chillicothe was 14th with 73 points, Paint Valley was 15th with 48 points, Circleville was 16th with 42 points and Unioto was 17th with 41 points. The Panthers had two weight class champions. Mcale Callahan won the 138-pound category, going 4-0 on the day. He began with a pin of Brice Maclachlan of Unioto in 44 seconds. In the second round, Callahan pinned Aaliyah Henderson of Taylor in 48 seconds. In the sixth round, Callahan won a 15-5 major decision over Ashten Moody of Unioto. In the championship match, Callahan earned a 13-3 major decision over Dean Hurd of Greenville. 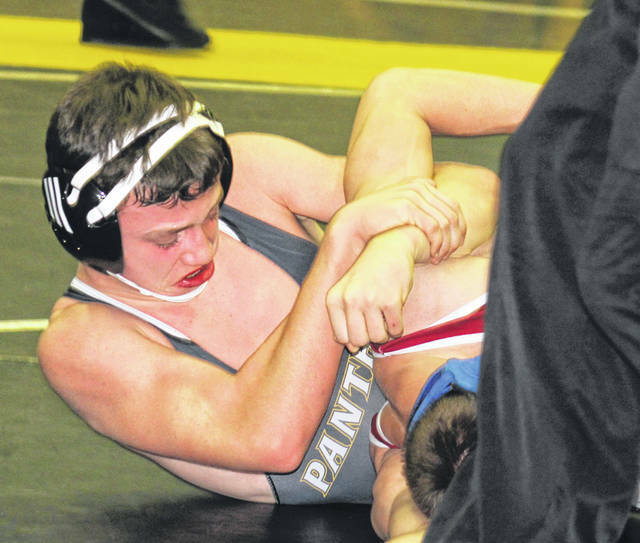 James Munro went 4-0 for the Panthers in winning the 160-pound weight class. Munro began with a pin of Preston Gray of Adena in 52 seconds. In his next match, Munro pinned Cole Hartley of Logan Elm in 1:49. In the following bout, Munro pinned Marshaun Armstrong of Groveport-Madison in 56 seconds. Munro completed his run to the title with a 7-1 decision of Brandon Gibson of Walton-Verona. Heavyweight Grant DeBruin placed second for the Panthers, going 4-1 at the tournament. DeBruin began with a pin of Graison Diouara of Chillicothe in 37 seconds. He then pinned Tykel Hancock of Groveport-Madison in 2:51. In his third match, DeBruin pinned again, this time over Logan Marburger of Brookville in 38 seconds. DeBruin had his fourth win by fall over Mason Mills of West Carrollton in 2:51. In the championship match, DeBruin battled Jon Mitchell of Brookville who won by pin in 3:48. Weston Melvin placed fifth at 106 pounds for the Panthers. In his first match, Melvin won by pin over Makayla Young of Bellefontaine in 5:06. Up next for Melvin was Jared Ullmann of Taylor. Melvin won by pin in 1:02. In his third match Melvin lost to Malachi O’Leary of Wyoming by a 13-4 major decision. Melvin rebounded by pinning Eli Jackson of Groveport-Madison in 4:29. In the final round, Melvin claimed a 7-2 decision over Cole Renier of Logan Elm. Graham Carson placed fifth at 132 pounds for Miami Trace. Carson had a quick pin of Anthony Butts of Walton-Verona in 20 seconds. Carson pinned Ashton Kinnison of Unioto in 1:20. Carson then dropped a 12-7 decision to Tyrone Keeton of West Carrollton. He earned a 10-3 decision over Lucky Donaldson of Circleville. In the final round, Carson took a 9-3 decision over Garrett Simmons of Adena to finish fifth. Jayden LeBeau finished in eighth place for Miami Trace at 145 pounds. LeBeau won his first match by pin in 5:28 over Alex Brown of Zane Trace. 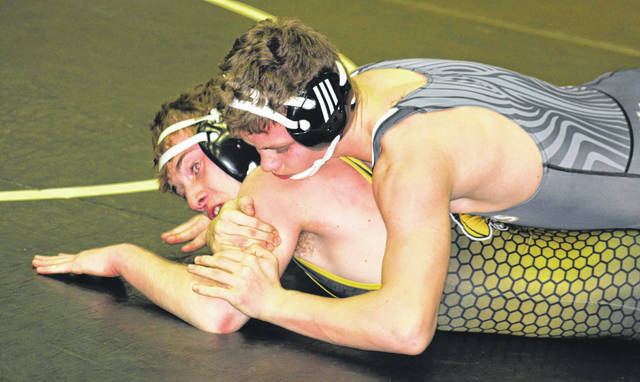 LeBeau then lost a high-scoring match to Tristan Duffey of Warren, 19-14. Jacob Goldsmith pinned LeBeau in 2:31 and in his final bout, LeBeau was pinned by Isaac Gray of Adena in 2:10. Seymour pinned Tony Martini of Taylor in 59 seconds. Seymour then lost a 9-8 decision to Gage Dyke of Zane Trace. Landon Hanes of Warren pinned Seymour in 2:05. In the final round, Logan Thatcher of Greenville pinned Seymour in 3:18. Also competing in the tournament for Miami Trace were: Shane Seymour, 132; Dawson Wallace, 152; Zach Tinkler, 170; Ashton Curtis, 182; David Tyndall, 195; Alex Boldman, 220 and Weston Pettit, 285. Those wrestlers each went 0-2 on the day. “Our kids had a rough start to the day during the first three rounds,” Miami Trace head coach Ben Fondale said. “We had a team meeting after round three and the seniors also spoke to their teammates which turned around our attitude and intensity for the following two rounds. “I know the team isn’t happy with fourth place, but considering we had two of our starters out this week, I think our boys should be proud of how things finished up,” Fondale said. Miami Trace will be hosting and competing in the OHSAA Division II Region 14 State Duals Saturday at the new high school.